We like binoculars with built-in Laser Rangefinding capability. With rangefinding binoculars, you can carry one less piece of gear, and a binocular optic is much more effective in the field than the monocular on a typical dedicated laser rangefinder (LRF). 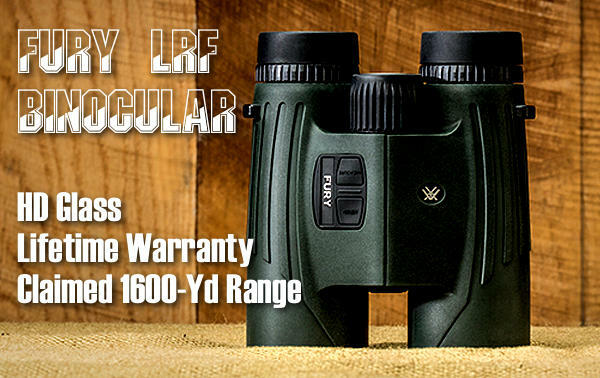 The stereo view gives better definition and depth perception, and the larger, binocular lenses give better low-light performance than the smaller-diameter monocular optic found in a conventional LRF. Leica and Swarovski make excellent rangefinding binoculars, with great glass and impressive laser performance. But these European LRF Binoculars are very expensive — the latest Leica 10×42 Geovid is $2600.00 and the Swarovski 10×42 EL hits the three grand ($3000.00) mark. Frankly, that’s just too expensive for the vast majority of consumers. Enter Vortex into the HD rangefinding binoculars marketplace with a quality, life-time “unconditional” guaranteed product at less than HALF the price of the Leica Geovid. 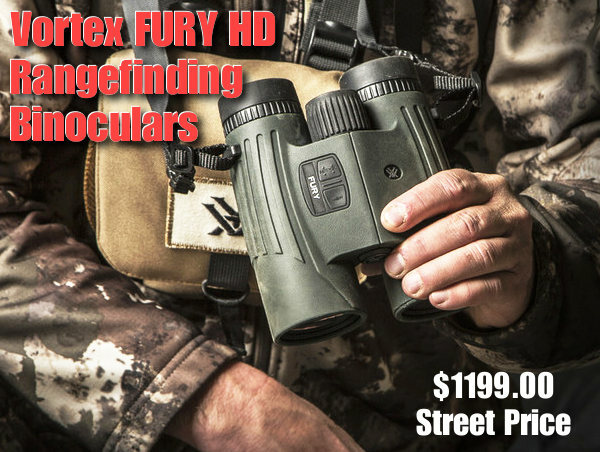 MSRP of the Vortex’s new Fury HD Laser Rangefinder Binoculars is $1599.00, but “street price” will be hundreds less. Vortex says “expect to pay about $1199.00 at dealers for the Fury HD”. A lot more guys can afford $1200.00 than $2600.00, that’s for sure. The Fury HD has good glass — fully multicoated HD lenses with good lowlight performance. The armored housing seems pretty tough. We like the fact that Vortex has provided a left eye diopter adjustment so users can fine-tune image focus for their vision. Vortex says the Fury HD will range “reflective targets to 1600 yards with an ultra-fast readout”. That may be a bit generous. In the real world, we expect the hand-held Fury HD to range deer-sized objects out to 800 yards or so, and larger objects (such as vehicles) out to 1200. This is based on our testing of other similar rangefinding binoculars. 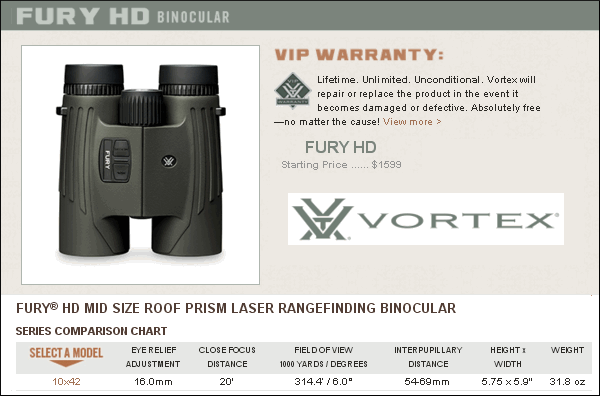 Share the post "New Fury HD Laser Rangefinding Binoculars from Vortex"